Alexandria Ocasio-Cortez won against all odds. The 28-year-old Bronx-born Puerto Rican just defeated Rep. Joe Crowley, one of the most powerful Democrats in the U.S. House of Representatives. She was the first person in 14 years to challenge him in a primary. 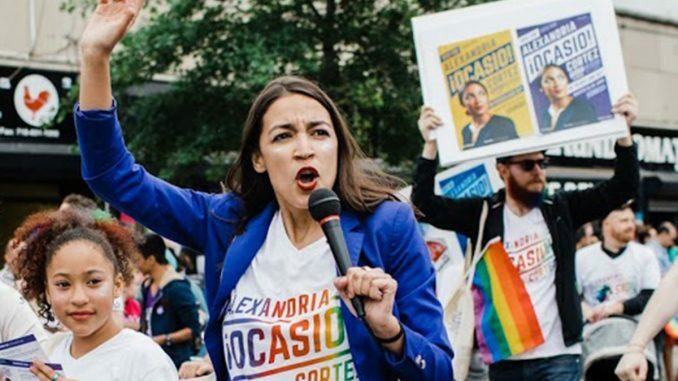 Ocasio-Cortez, a Democratic socialist, ran for office with an entirely progressive platform and by rejecting donations from corporate political action committees (PACs). She is calling for the creation of a single-payer healthcare system, commonly known as Medicare for All; for abolishing the U.S. Immigration and Customs Enforcement (ICE) agency; for establishing a federal jobs guarantee; and for allowing a Marshall Plan for Puerto Rico so the U.S. territory can continue to recover from last year’s storms. No one expected Ocasio-Cortez, a working class woman, to defeat one of the most powerful Democrats in Congress. But she did it, thanks to her grassroots efforts. In an interview with Refinery29 earlier this month, Ocasio-Cortez talked about the obvious challenges she faced because she didn’t have the support from the Democratic establishment. Ocasio-Cortez is one of the many Democrats challenging incumbents from the left. If she goes on to win the general, she could become the youngest congresswoman ever elected. In her interview with Refinery29, she recognized the weight winning the general election could have.